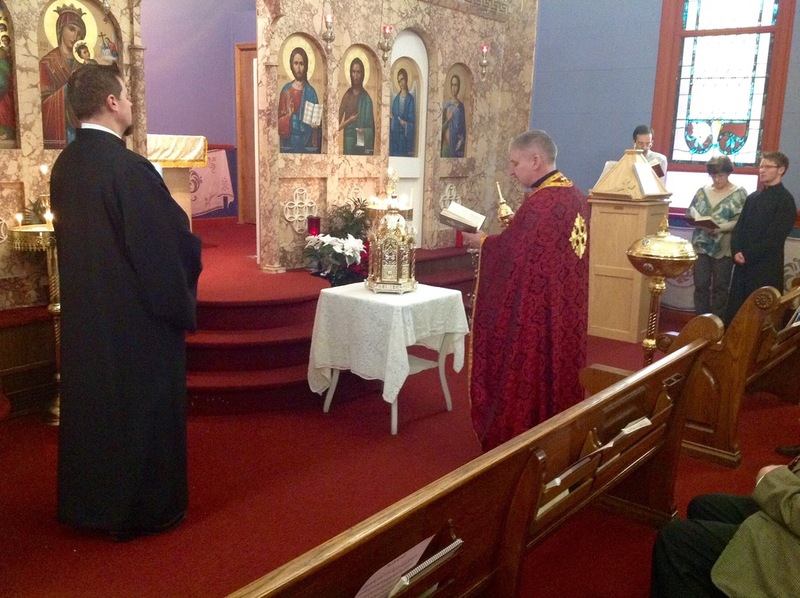 On March 17th the new Gospel and Chalice set were blessed so they could be put into use on the altar. 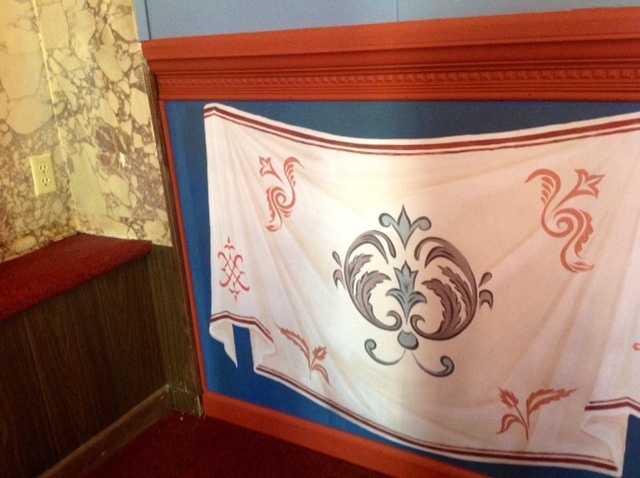 These beautiful items were donated in memory of the departed of the Steele family. 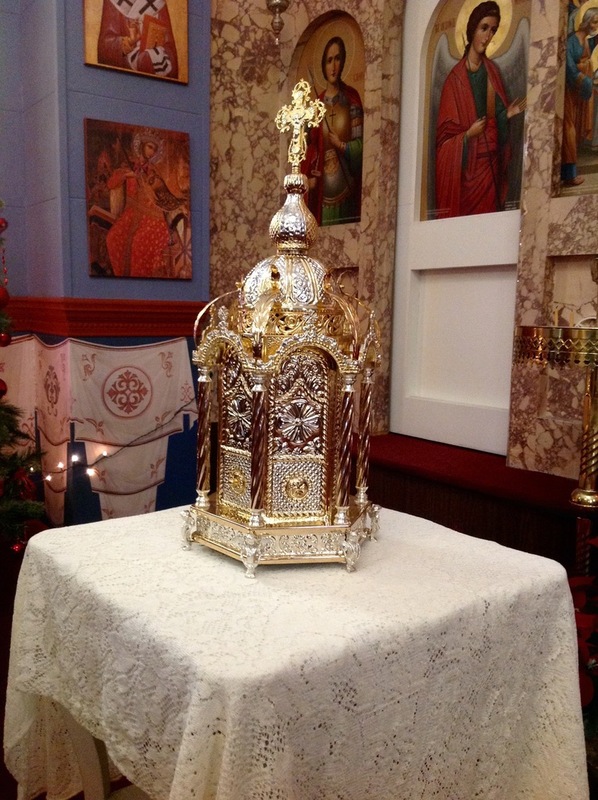 We are very blessed to have these new items on the altar and they will serve the church for many years reminding us of them everytime we have a service. 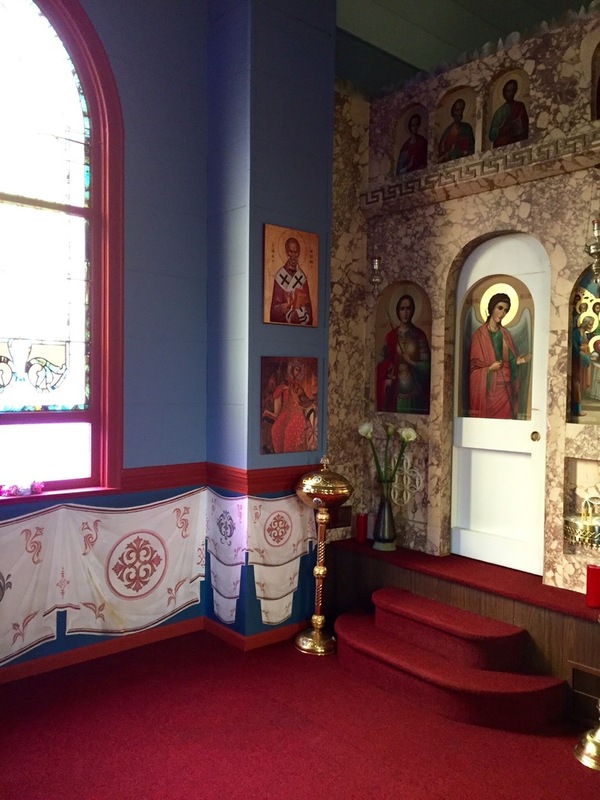 The icon of Christ the High Priest was hung behind the altar just below the Resurrection Icon on Pentecost and the icons of St. 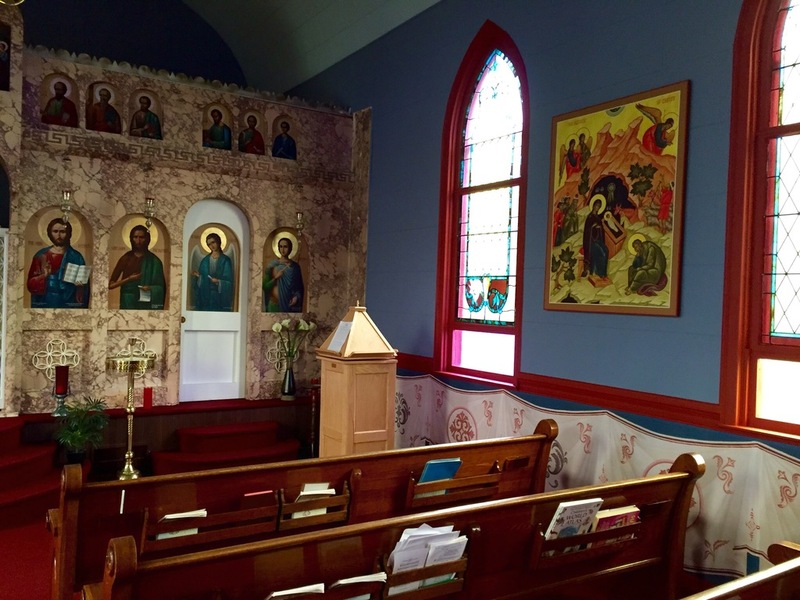 Basil and St. John Chyrsostom were installed to the left and right of the icon of Christ in mid-August. 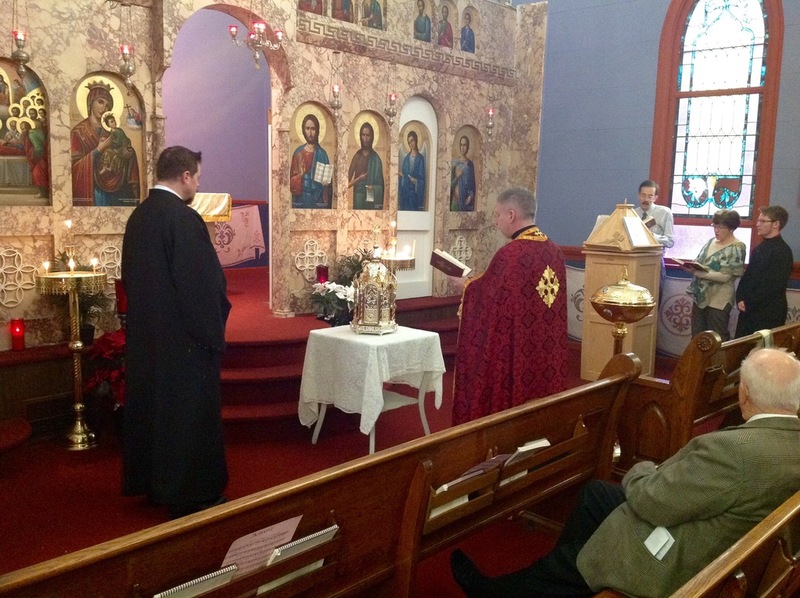 In mid-Septmber St. Nektarios and St. Anthony the Great were added to the altar area. 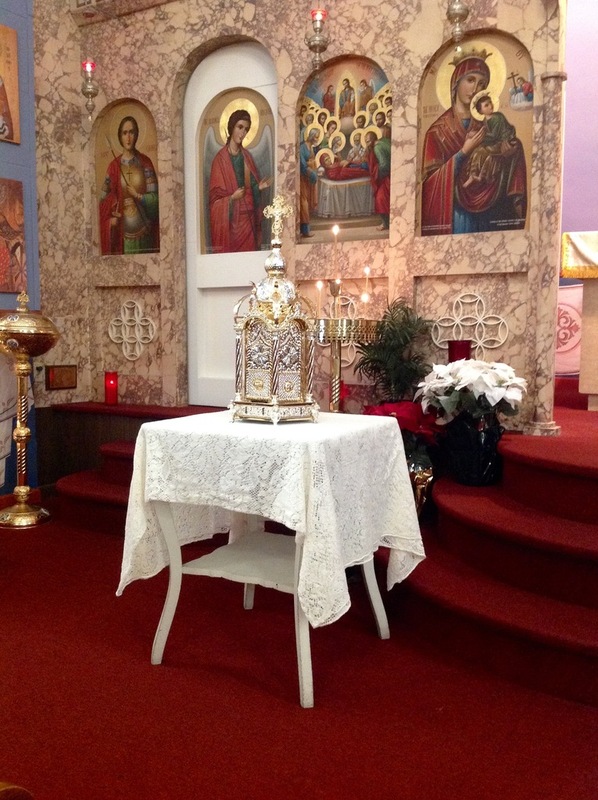 There are more icons planned to fill the altar space and to be added in the main church. If you are interested in sponsoring one of these icons please speak with Fr. Mark or Michelle. Thank you to those who sponsored these icons! 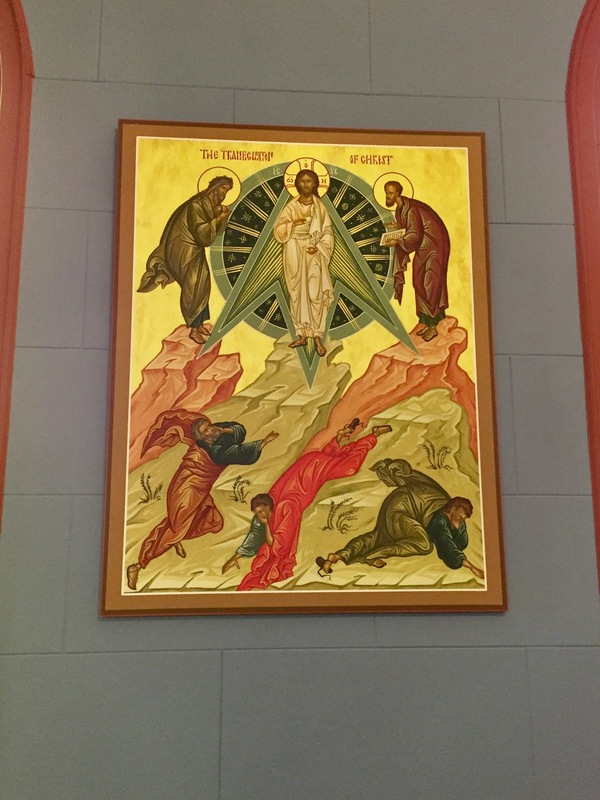 The newest addition to St. Mary's ongoing iconography project is the icon of the Transfiguration. 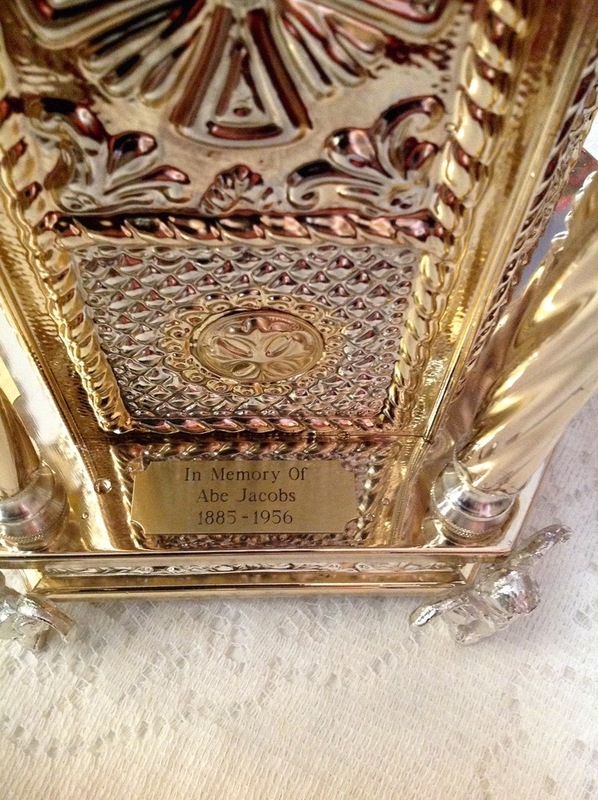 This icon was purchased in memory of Lola Jacobs. Thank you to all those who contributed to her memorial fund. May her memory be eternal! 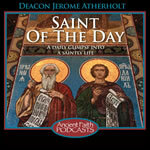 We have several more large format feast day icons and smaller Old Testament Prophet icons in our future iconography plans. 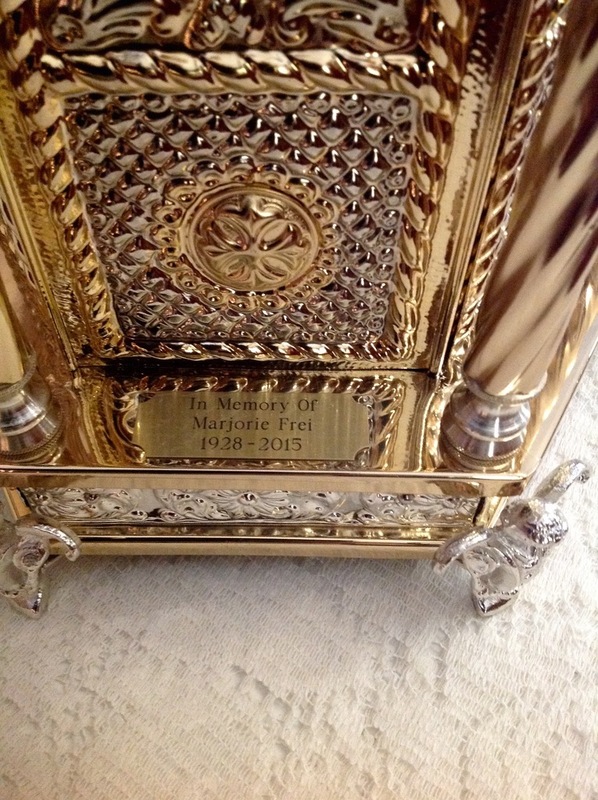 If you are interested in sponsoring one of the the icons in memory of a family member please speak with Fr. Mark or Michelle for more details. 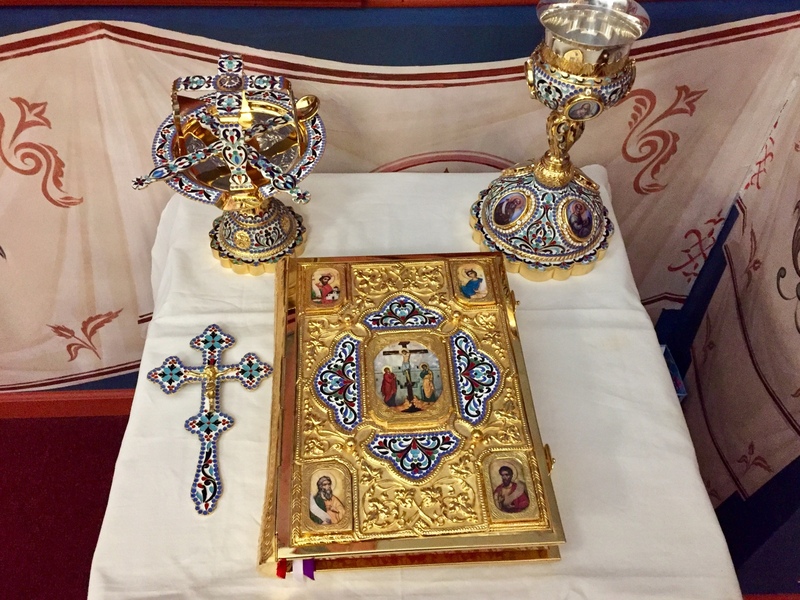 The next two large format icons in our series of Feast Day icons were picked up from the Damascene Gallery and displayed in the church during the 7/24 Divine Liturgy. 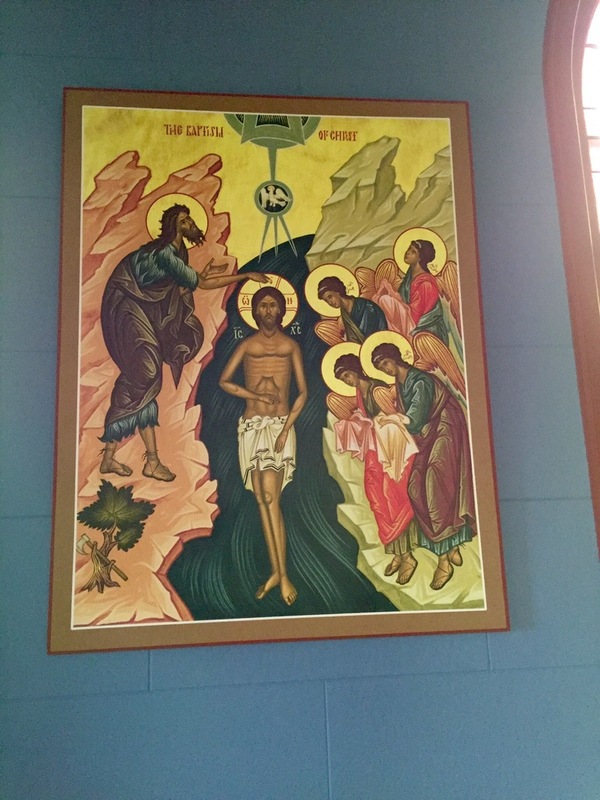 We selected the Penetcost and Crucifixion Icons. 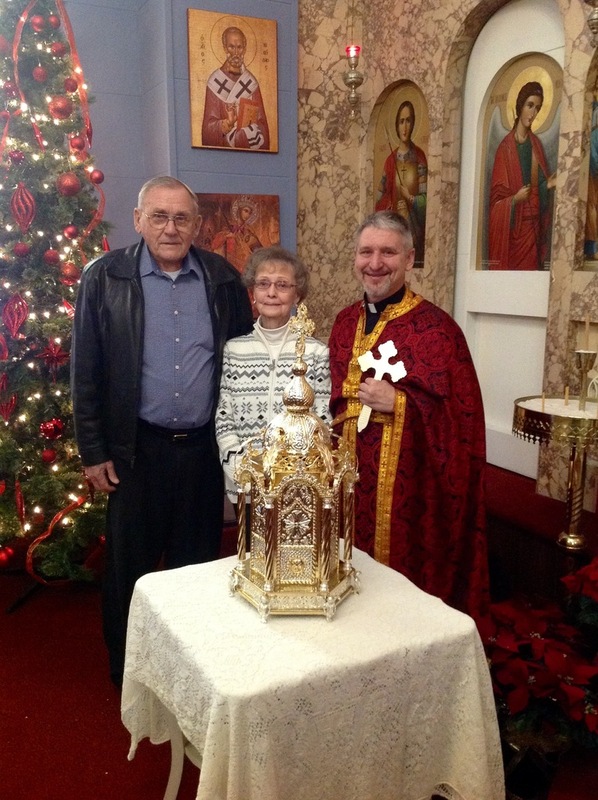 They are beautiful icons and we are so blessed to have them in our church! 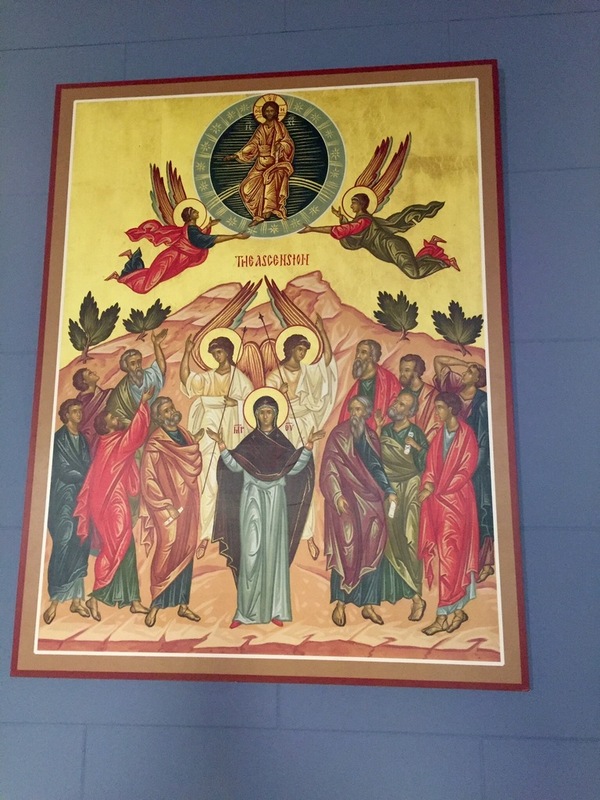 Our iconography plans include large format Feast Day icons, a series of smaller Old Testament Prophet icons, and the Pantocrator icon for the ceiling. If you are interested in seeing pictures of the icons and would like to sponsor one in memory of a family member please speak to Fr. Mark. 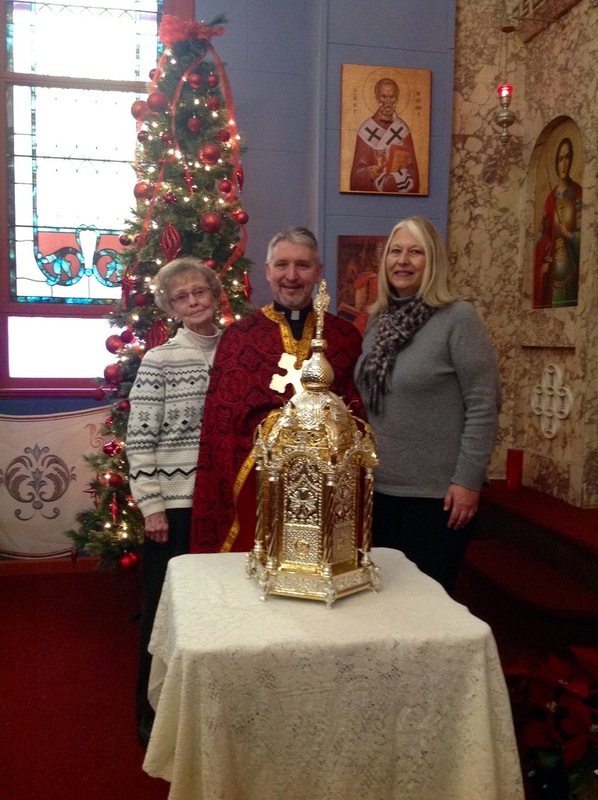 On Dec. 13th the new tabernacle donated in memory of Marjorie Frei and Richard Abraham was blessed. 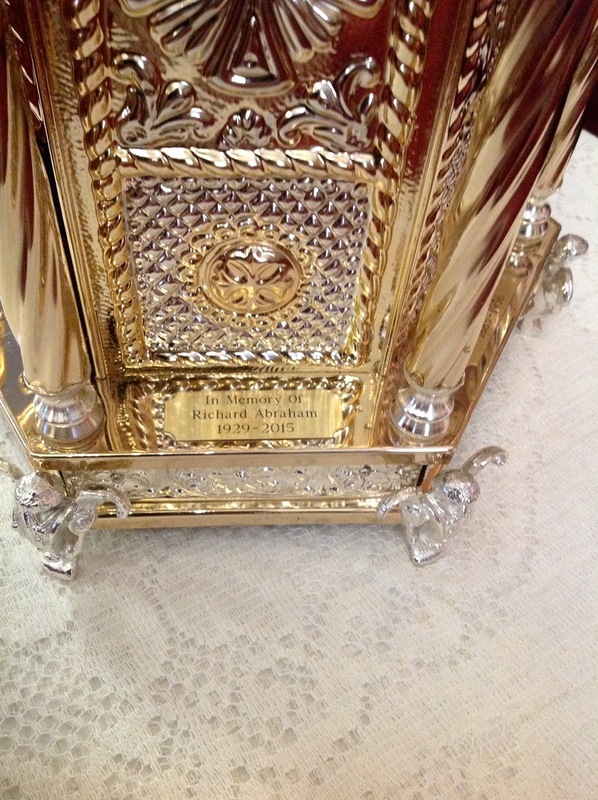 The beautiful tabernacle will now reside on the holy altar. 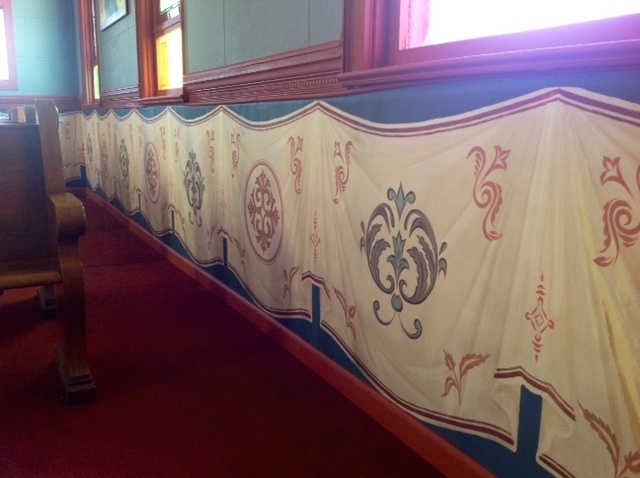 The iconographic toweling was installed at the church the week of July 12th. The results are stunning! Thank you to Fr. 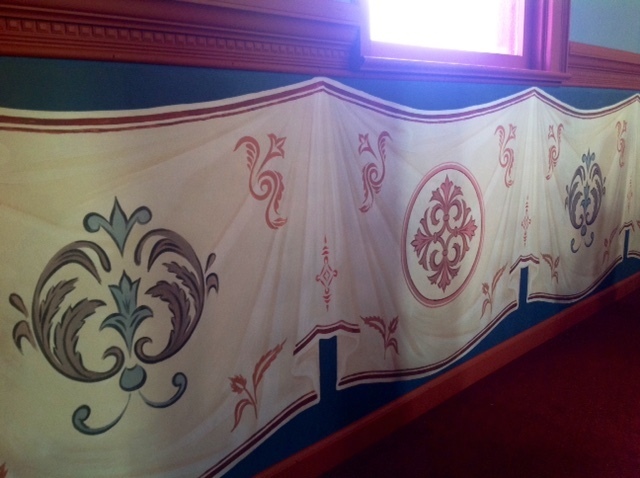 Jonah of the Damascene Gallery for the design and installation of this beautiful addition to our church. 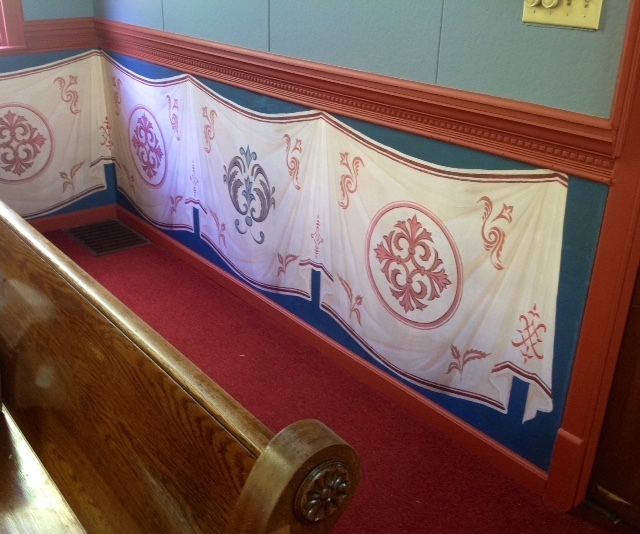 Interior painting of the church was completed the week of May 3rd. 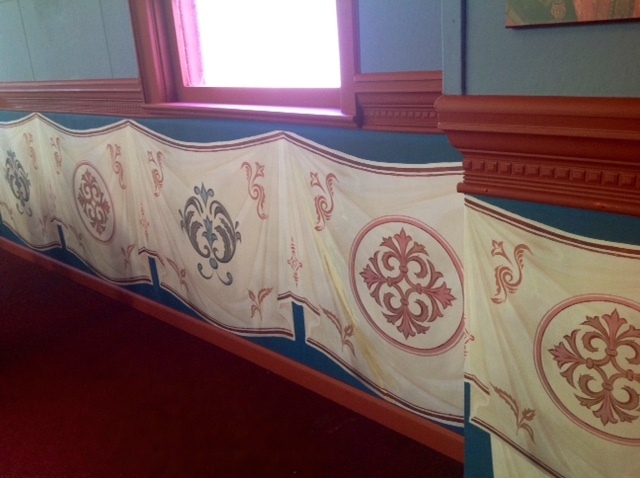 The new colors accentuate the Iconography beautifully! Many thanks to Fr. Jonah at the Damascene Gallery for his expert advice on color choices. 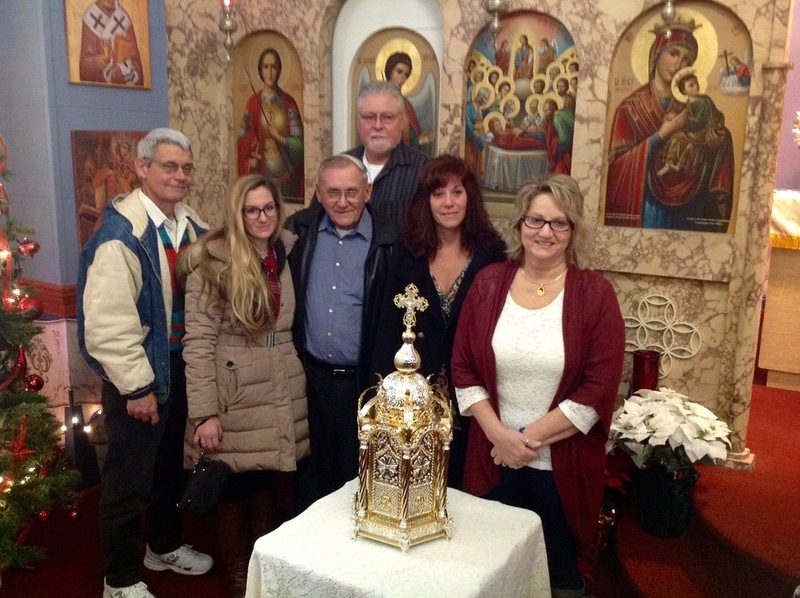 Thanks to the generous donations of parishioners and friends, the next Icons in the planned renovations of the interior of the church are currently in production at Damascene Gallery and will be picked up mid October. 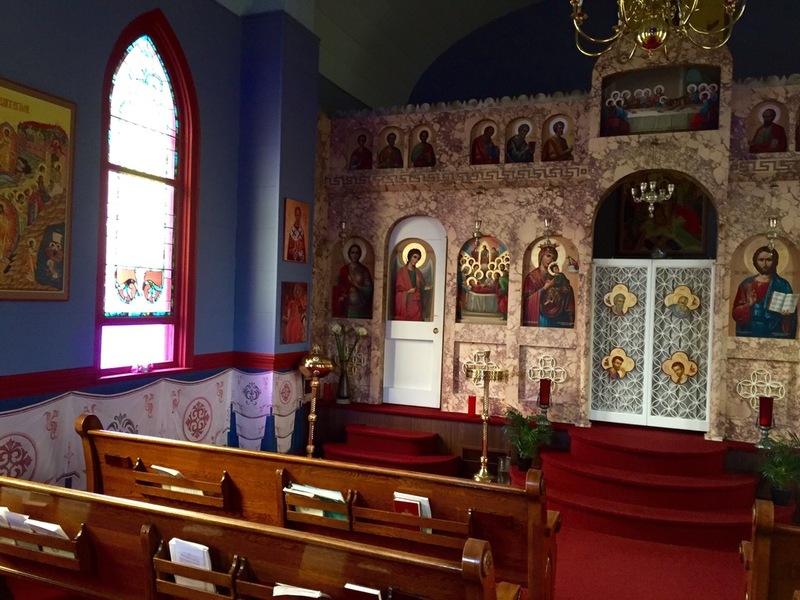 Renovations will include eight more new large Icons like the ones already added this spring, along with special trim for the nave and altar area and a five foot round Pantocrator icon of Christ mounted high in the nave. This ordered icon is the icon of the Platytera and will be placed high above the Icon of the Resurrection in the altar area. It will eventually be flanked on the left by the icon of the Annunciation and on the right by the Icon of the Presentation of the Theotokos. 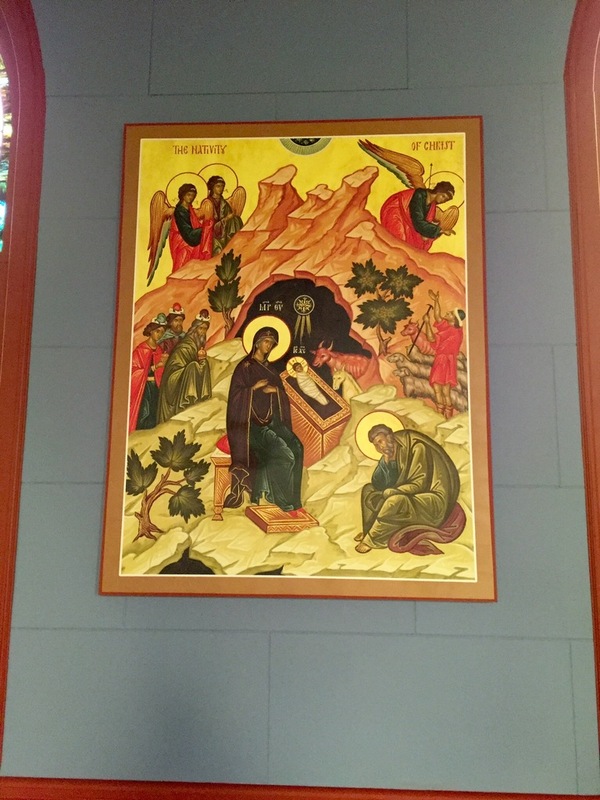 The next two Icons to be placed in the nave of the church include Nativity and Theopany have also been ordered and are in production. For those who have quietly sponsored this project, may God send his blessings upon you and your families. This work that is done in silence, to the glory of God, has already inspired many and will continue to produce fruit for many generations. In order to complete the project, we will need the support of many more donors. 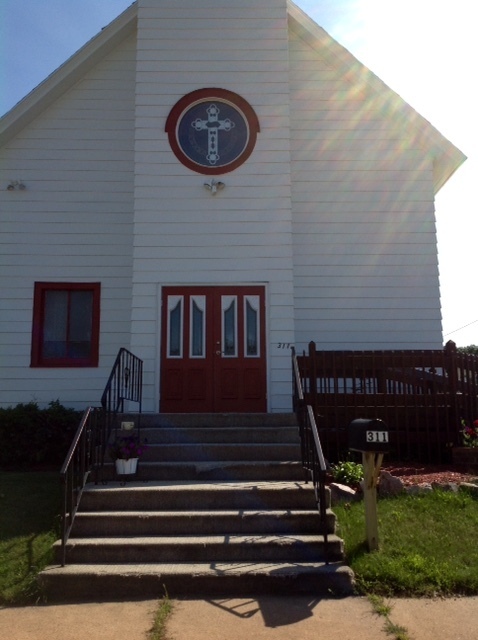 For more information, or to see a plan of the renovations, contact Fr Mark or Michelle. Any donations specifically for the Iconongraphy should have that noted on the memo of the check so they can be properly applied towards the project. 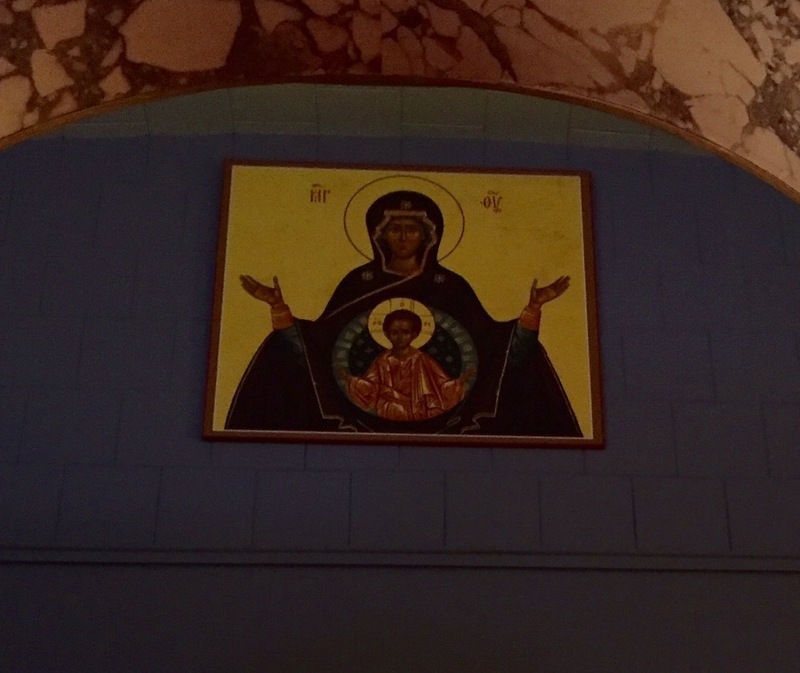 New Iconography has been installed in the main church Sanctuary. 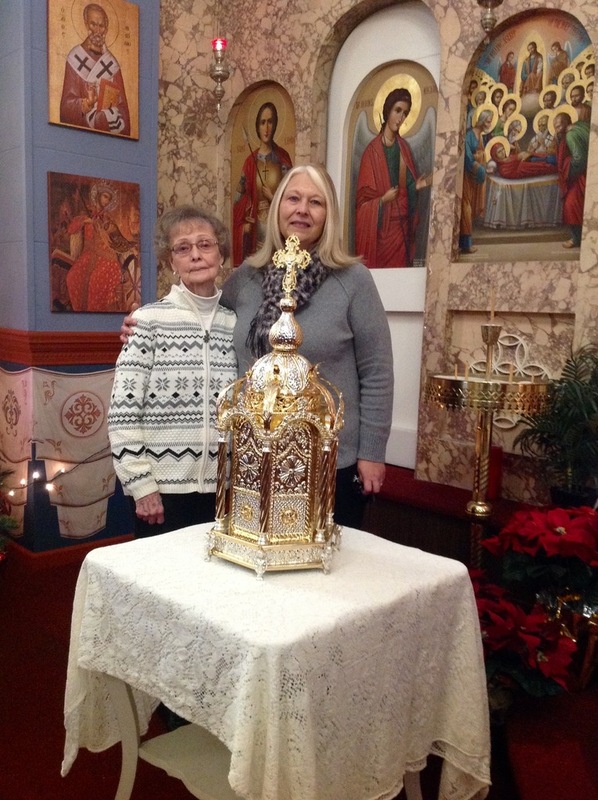 The first icon in this series was donated in loving memory of Rose Sovey. This is the Resurrection icon behind the altar area, visible through the royal doors. It is a constant reminder that we serve a Risen Lord. Our faith is focused on the Resurrection! We are reminded that death is defeated and has no power over us, and that we shall be raised like Adam and Eve in the icon. It is very rich, and will bless our church. Thank you to those who donated in memorial of Rose! 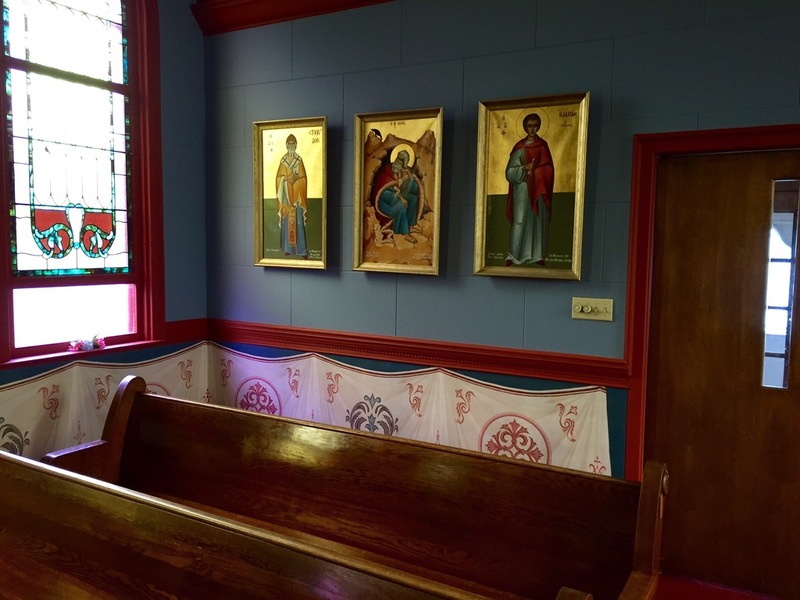 The other two new icons, located on the side walls are of the Resurrection and of the Ascension. Both beautiful pieces that brighten the church with all their meaning and details.